The old oven finally passed on. But in true rage against the dying of the light style, tried to take us with it if it could, spewing gas relentlessly out of the burners and eventually having to be shut off at the wall and dragged away in a shower of rust by Caesar and Manny. And so a new oven arrived, all white and shiny and eager to please. So eager to please in fact that it clicked its pilot light on for no apparent reason intermittently throughout the night. “It keeps clicking,” I said as Caesar and Manny watched the oven skeptically waiting for something to happen. “Are you certain?” Manny wondered. “It would,” said Caesar as the oven stayed resolutely silent. “You mean, clicking like it’s not doing now,” noted Caesar, the comedian of the two. “It’s going to do it.” They both gave me a look. At which point the oven clicked and turned on the front two burners. “I’ll get the trolley” said Manny. “I’ll turn off the gas” said Caesar. Half an hour later, they came back with a new oven. Nothing puts an oven through its paces like a pavlova. The differences in individual ovens’ ideas of 250f is so enormous, and the difference that a fan makes, or the position of a shelf makes can be marked. 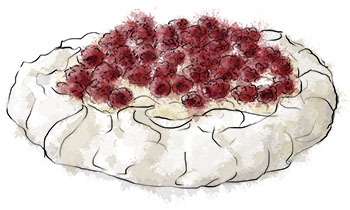 A pavlova is where these individual quirks come to light, and where they can be accommodated. The first pav is always something of an experiment in timing and especially in temperature (too hot and it’s going to take on a cream shade rather than stark white). But once you know how to make a pav in your oven, it’s one of the easiest and most delicious deserts in existence. So the first time, make notes. If the pav browns, the heat is too high. Turn it down. Cook it for longer, write down what you did. My old fan oven easily cooked a pav in an hour. My last oven took longer. Also, that oven had strange uneven heat, so my solution was to turn the pav around every 15 mins or so. If your first pav doesn’t wok out quite the way you’d like, crumble the meringue, stir into whipped cream and fruit and call it Eton mess. To me, an oven is an oven, but once I’ve made a pavlova, it’s my oven. This entry was posted in The Monday Treat and tagged cream, egg, pavlova, raspberries, vegetarian. Bookmark the permalink. I’ve never tried my hand at pav, you make it sound so easy! I can picture it and it looks amazing. There’s something about the combination of heavy whipping cream, berries and white chocolate that scream decadence! It is easy to make, and fun too – it’s great to see the ingredients transform so dramatically. If you’re making pav for the first time though it’s totally worth having a practice run before serving it at a dinner party – it really is amazing how different ovens are – it may take a little more time, or need a cooler setting on the dial (to keep it white white rather than cream white). But once you’ve got the hang of it, it’s such a crowd pleaser, and quite the most delicious thing. Great in the summer too when there are all kinds of fruit at the market. I make Nigella Lawson’s version with passion fruit all the time, and Delia’s strawberry version. Both delicious. 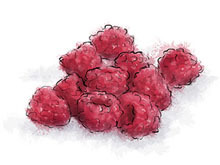 I love the combo of grated white chocolate with raspberries – sometimes I make a version of Eton mess with crumbled shop bought meringues mixed into whipped cream with raspberries and white choc – it’s a great fast desert if people are coming over at short notice.